True Crime Diary began when Michelle McNamara, a writer, decided the investigating she was doing on unsolved crimes to satisfy her own curiosity might be better shared. Covering both breaking stories and cold cases, True Crime Diary seeks to find the angle others have overlooked - a suspect's revealing online activities, for instance, or a similarity between cases that hasn't been made public yet. Additional information now comes from interviews with law enforcement, and victims' family members, friends and associates. 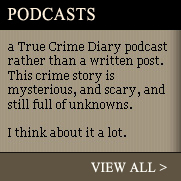 True Crime Diary is not interested in looking back at notorious criminals and saying, wow. We're interested in looking at unfolding cases and asking, who?